Josloff Glass remains true to its roots by maintaining a tireless work ethic and dedication to providing its customers the best service. Founded in 1903, Josloff Glass, a family business located in Newark, New Jersey has endured over 115 years of social and economic challenges while developing a preeminent presence in the New Jersey glass and glazing marketplace. The story of Josloff Glass extends beyond the 21st or 20th centuries and includes three generational transitions, two world wars, and countless economic climate changes. Through it all, Josloff Glass has remained dedicated to its craft, its customers, and the City of Newark. This is our story. In 1891, Ezra Josloff endeavored to establish a better life for himself by making the long and difficult immigration from Russia to the United States. After successfully reaching the United States, Ezra settled in to Newark, New Jersey. Looking for work, Ezra decided to pursue a living in the local neighborhood repairing broken window glass. Through his great success as a sole proprietor he then established the Josloff Glass Company on Prince Street in Newark in 1903. Ezra & family successfully operated his business out of the Prince Street facility. From 1903 to 1962 Ezra & family successfully operated his business out of the Prince Street facility. In 1917 Ezra’s son Sol joined him on Prince Street to develop his abilities in the family craft. Mentored by his father, Sol developed as an artisan craftsman and businessman. Excited by the progress of his son and the continued growth of the business, Ezra relinquished primary control of the business to his son and the next chapter began. Josloff Glass moved the business to a larger facility off Meeker Avenue, and begins the 3rd generational transition for the business. Under Sol’s command, Josloff Glass expanded upon its foundation as a residential repair company to now include small commercial projects in Newark. Incorporating this type of work into the business portfolio was a challenging task for Sol. Sol solicited the help of his wife Ray Ann & brothers. 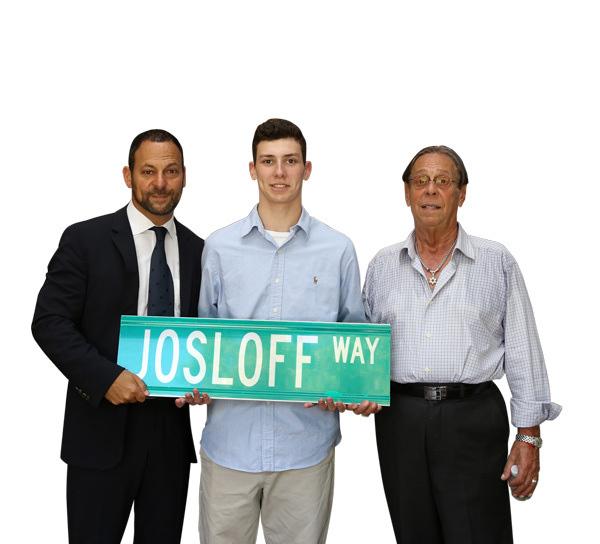 Under the burden of their great success, Josloff Glass needed to transition the business to a larger facility and in 1962 did so by moving to the South ward of Newark to present day Meeker Avenue. 1962 also marked another important milestone in the Josloff Glass history. In 1962, Larry & Alberta Josloff joined Sol and his wife Ray Ann on Meeker Avenue to begin the 3rd generational transition for the business. Under the guidance of his father, Larry and Alberta further expanded the portfolio of work to include new construction, service work for the City of Newark, and a full array of necessary duties at Newark International Airport. Josloff develops a new larger facility down the street at present day 169 Meeker Ave.
With unprecedented growth, the original Meeker Avenue facility was unable to sustain the business. In 1988 Sol, Ray Ann, Larry, & Alberta decided to develop a new larger facility down the street at present day 169 Meeker Ave. After numerous renovations and expansions, the 169 Meeker Avenue facility remains the present-day hub of all operations at Josloff Glass. In 1995, Larry & Alberta welcomed their only son Ian to the family business on Meeker Avenue. The approach of developing Ian’s knowledge and skillset in the industry was the same as it had been for the 3 generations past. Ian Josloff was sent to the field to get the hands on practical experience that his predecessors survived by. With a well-developed practical knowledge and a keen business sense, Ian transition from field to office. Larry and Alberta mentored their son Ian to run the family business. Under Ian’s management, the business reaches new levels in both volume and complexity. Since 1995, Josloff Glass has enjoyed continued responsible success in the New Jersey glass and glazing marketplace. Under Ian’s management, the business has reached new levels in both volume and complexity. Individual projects now regularly exceed $10,000,000.00 with annual sales approaching $50,000,000.00. All this great success has been made possible by Josloff Glass remaining true to its roots by maintaining a tireless work ethic and dedication to providing its customers the best service.